Nothing can go faster than the speed of light in a vacuum. But particles in our Universe can’t even go that fast. When it comes to speed limits, the ultimate one set by the laws of physics themselves is the speed of light. As Albert Einstein first realized, everyone looking at a light ray sees that it appears to move at the same speed, regardless of whether it’s moving towards you or away from you. No matter how fast you travel or in what direction, all light always moves at the same speed, and this is true for all observers at all times. Moreover, anything that’s made of matter can only approach, but never reach, the speed of light. If you don’t have mass, you must move at the speed of light; if you do have mass, you can never reach it. But practically, in our Universe, there’s an even more restrictive speed limit for matter, and it’s lower than the speed of light. Here’s the scientific story of the real cosmic speed limit. When scientists talk about the speed of light — 299,792,458 m/s — we implicitly mean “the speed of light in a vacuum.” Only in the absence of particles, fields, or a medium to travel through can we achieve this ultimate cosmic speed. Even at that, it’s only the truly massless particles and waves that can achieve this speed. This includes photons, gluons, and gravitational waves, but not anything else we know of. Quarks, leptons, neutrinos, and even the hypothesized dark matter all have masses as a property inherent to them. Objects made out of these particles, like protons, atoms, and human beings all have mass, too. As a result, they can approach, but never reach, the speed of light in a vacuum. No matter how much energy you put into them, the speed of light, even in a vacuum, will forever be unattainable. But there’s no such thing, practically, as a perfect vacuum. Even in the deepest abyss of intergalactic space, there are three things you absolutely cannot get rid of. The WHIM: the warm-hot intergalactic medium. This tenuous, sparse plasma are the leftovers from the cosmic web. While matter clumps into stars, galaxies, and larger groupings, a fraction of that matter remains in the great voids of the Universe. Starlight ionizes it, creating a plasma that may make up about 50% of the total normal matter in the Universe. The CMB: the cosmic microwave background. This leftover bath of photons originates from the Big Bang, where it was at extremely high energies. Even today, at temperatures just 2.7 degrees above absolute zero, there are over 400 CMB photons per cubic centimeter of space. The CNB: the cosmic neutrino background. The Big Bang, in addition to photons, creates a bath of neutrinos. Outnumbering protons by perhaps a billion to one, many of these now-slow-moving particles fall into galaxies and clusters, but many remain in intergalactic space as well. Any particle traveling through the Universe will encounter particles from the WHIM, neutrinos from the CNB, and photons from the CMB. Even though they’re the lowest-energy things, the CMB photons are the most numerous and evenly-distributed particles of all. No matter how you’re generated or how much energy you have, it’s not really possible to avoid interacting with this 13.8 billion year old radiation. When we think about the highest-energy particles in the Universe — i.e., the ones that will be moving the fastest — we fully expect they’ll be generated under the most extreme conditions the Universe has to offer. That means we think we’ll find them where energies are highest and fields are strongest: in the vicinity of collapsed objects like neutron stars and black holes. Neutron stars and black hole are where you can not only find the strongest gravitational fields in the Universe, but — in theory — the strongest electromagnetic fields, too. The extremely strong fields are generated by charged particles, either on the surface of a neutron star or in the accretion disk around a black hole, that move close to the speed of light. Moving charged particles generate magnetic fields, and as particles move through these fields, they accelerate. This acceleration causes not only the emission of light of a myriad of wavelengths, from X-rays down to radio waves, but also the fastest, highest-energy particles ever seen: cosmic rays. Whereas the Large Hadron Collider accelerates particles here on Earth up to a maximum velocity of 299,792,455 m/s, or 99.999999% the speed of light, cosmic rays can smash that barrier. The highest-energy cosmic rays have approximately 36 million times the energy of the fastest protons ever created at the Large Hadron Collider. Assuming that these cosmic rays are also made of protons gives a speed of 299,792,457.99999999999992 m/s, which is extremely close to, but still below, the speed of light in a vacuum. There’s a very good reason that, by time we receive them, these cosmic rays aren’t more energetic than this. The problem is that space isn’t a vacuum. In particular, the CMB will have its photons collide and interact with these particles as they travel through the Universe. No matter how high the energy is of the particle you made, it has to pass through the radiation bath that’s left over from the Big Bang in order to reach you. Even though this radiation is incredibly cold, at an average temperature of some 2.725 Kelvin, the mean energy of each photon in there isn’t negligible; it’s around 0.00023 electron-Volts. 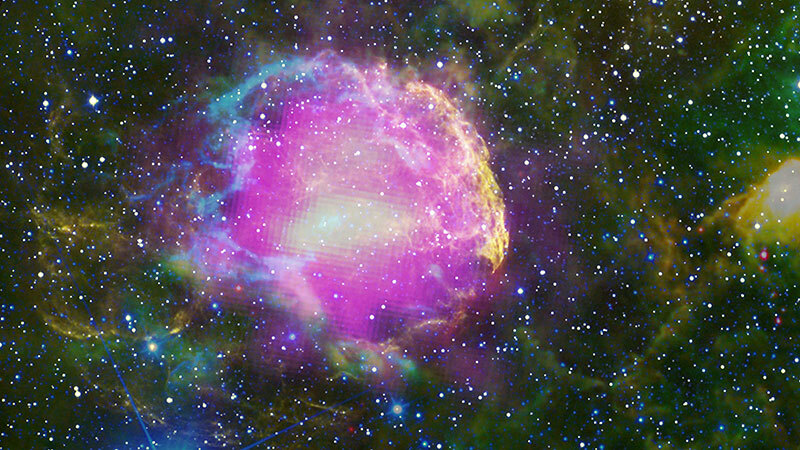 Even though that’s a tiny number, the cosmic rays hitting it can be incredibly energetic. Every time a high-energy charged particle interacts with a photon, it has the same possibility that all interacting particles have: if it’s energetically allowed, by E=mc², then there’s a chance it can create a new particle! If you ever create a particle with energies in excess of 5 × 10¹⁹ eV, they can only travel a few million light years — max — before one of these photons, left over from the Big Bang, interacts with it. When that interaction occurs, there will be enough energy to produce a neutral pion, which steals energy away from the original cosmic ray. The more energetic your particle is, the more likely you are to produce pions, which you’ll continue to do until you fall below this theoretical cosmic energy limit, known as the GZK cutoff. (Named for three physicists: Greisen, Zatsepin, and Kuzmin.) There’s even more braking (Bremsstrahlung) radiation that arises from interactions with any particles in the interstellar/intergalactic medium. Even lower-energy particles are subject to it, and radiate energy away in droves as electron/positron pairs (and other particles) are produced. 3.or they’re not protons at all, but composite nuclei. The few particles we’ve seen that break the GZK barrier are indeed in excess of 5 × 10¹⁹ eV, in terms of energy, but do not exceed 3 × 10²¹ eV, which would be the corresponding energy value for an iron nucleus. Since many of the highest-energy cosmic rays have been confirmed to be heavy nuclei, rather than individual protons, this reigns as the most likely explanation for the extreme ultra-high-energy cosmic rays. There is a speed limit to the particles that travel through the Universe, and it isn’t the speed of light. Instead, it’s a value that’s very slightly lower, dictated by the amount of energy in the leftover glow from the Big Bang. As the Universe continues to expand and cool, that speed limit will slowly rise over cosmic timescales, getting ever-closer to the speed of light. But remember, as you travel through the Universe, if you go too fast, even the radiation left over from the Big Bang can fry you. So long as you’re made of matter, there’s a cosmic speed limit that you simply cannot overcome. When you hit a piece of metal with a strong enough laser pulse you get a plasma – a hot, ionized gas found in everything from lightning to the sun. Studying it helps scientists understand what’s going on inside stars and could enable new types of particle accelerators for cancer treatment. Now a team of researchers has used an X-ray laser to measure, for the first time, how a plasma created by a laser blast expands in the hundreds of femtoseconds (quadrillionths of a second) after it’s created. Their technique could eventually reveal tiny instabilities in the plasma that swirl like cream in a cup of coffee. The experiments at the Department of Energy’s SLAC National Accelerator Laboratory involved scientists from SLAC, German research center Helmholtz-Zentrum Dresden-Rossendorf (HZDR) and other institutions, and was reported in Physical Review X in September. Led by scientist Thomas Kluge at HZDR, the researchers have been working to harness the behavior of plasma to create a new type of particle accelerator for proton therapy, an existing cancer treatment that involves blasting tumors with charged particles rather than X-rays. This approach is gentler on the surrounding healthy tissue than traditional radiation therapy. When solid matter is zapped with a laser the interaction forms a plasma, causing a steady stream of protons to burst out of the back side of the sample. The researchers hope to use the proton streams to storm tumors and obliterate cancer cells. But producing these fast protons in a reliable way requires a better understanding of how plasma changes as it expands. Until now, it was difficult to probe plasma changes directly because they’re so tiny and happen on extremely fast time scales. This work, says Josefine Metzkes-Ng, co-author and junior group leader at HZDR, could only be done at SLAC where the researchers used a high-power, short-pulse optical laser beam to create the plasma and the Linac Coherent Light Source X-ray free-electron laser to probe it. At the Matter in Extreme Conditions (MEC) instrument at LCLS, researchers create incredibly hot and dense matter that mimics the extreme conditions in the hearts of stars and planets. Simulations show that the researchers achieved a new temperature record for matter studied with a free-electron laser: 36 million degrees Fahrenheit, almost 10 million degrees hotter than the sun’s core. The researchers fabricated solid samples that consisted of raised silicon bars, like knuckles sticking out from a fist. They found that in the quadrillionths of seconds after they zapped the sample with intense, short pulses from the optical laser, tiny amounts of plasma stacked up between the knuckles. A special form of scattering that uses X-ray pulses from LCLS allowed them to peer inside the plasma to follow its evolution. This technique will pave the way for better understanding plasma instabilities, allowing researchers to create proton sources for cancer therapy with relatively small footprints that, unlike conventional accelerators, can be operated within a hospital. It will also be useful in research relevant to fusion energy, other types of novel particle accelerators and laboratory astrophysics. Siegfried Glenzer, director of the High Energy Density Division at SLAC, who helped with the paper, is especially excited about the prospect of using this technique to better understand the astrophysical processes that give cosmic rays – subatomic space particles that plunge into Earth’s atmosphere at almost the speed of light – their extreme energies. The highest-energy cosmic rays can pack a force comparable to that of a major league fastball hurtling toward a batter at 100 mph, condensed into a single subatomic particle. To accelerate a proton to the same energies as these cosmic rays, scientists would have to build an accelerator that sends particles traveling from Earth to Saturn and back. Using LCLS, scientists are able to recreate some of the astrophysical processes that may produce these high-energy cosmic rays, such as energetic jets that shoot out from the turbulent hearts of active galaxies. Now the new technique will allow them to directly observe the plasma instabilities that might be responsible for accelerating cosmic rays. According to Kluge, “This research has opened the black box of how short-pulse lasers interact with solids, allowing us to directly see a little of what’s going on, which previously could only be simulated with largely unverified atomic models. The research team also included scientists from Technical University Dresden, European XFEL, University of Siegen, Friedrich Schiller University Jena and Leibniz Institute of Photonic Technology, all in Germany. But, just above the grand gallery the researchers also spotted a new void area, they report today in Nature. The new cavity is nearly 8 meters high, 2 meters wide, and at least 30 meters long—like a cathedral, but much narrower—and it rises 20 meters above the ground in the pyramid’s core. Super-energetic space particles, which were thought to have been blasted toward Earth from somewhere outside our solar system, now have been discovered to be from very far away indeed — from far outside our Milky Way galaxy. The discovery was made by an international team that includes Penn State scientists and the Pierre Auger Collaboration, using the largest cosmic-ray instrument ever built, the Pierre Auger Observatory in Argentina. A paper describing the discovery will be published in the journal Science on Sept. 22. This animation illustrates the long journey of high-energy cosmic waves from the time they are shot into space from powerful events in galaxies far away from our Milky Way Galaxy until they eventually crash on Earth, leaving clues among the large array of cosmic-ray detectors in western Argentina, the Pierre Auger Observatory. 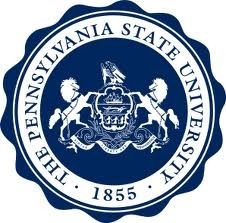 Penn State scientists are members of the Pierre Auger Consortium. “After more than a century since cosmic rays were first detected, this is the first truly significant result from our analysis of the detections, which now have revealed the distant origin of these ultra-high-energy cosmic rays,” said Miguel Mostafá at Penn State. He and Stephane Coutu — both professors of physics and of astronomy and astrophysics and Fellows of the American Physical Society — lead teams of students and post-doctoral scientists in research at Penn State’s Pierre Auger Collaboration group. “Now we know that the highest-energy particles in the universe came from other galaxies in our cosmological neighborhood,” Mostafá said. 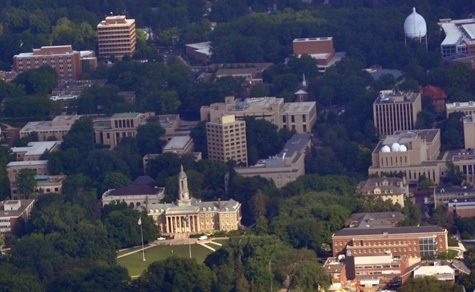 Mostafá and Coutu have been working on the project since 1996 and 1997, respectively, with support from the U.S. National Science Foundation. Mostafá has been a coordinator of the Auger team in charge of this analysis of cosmic-ray arrival directions, and is one of the corresponding authors on the Science article. Although the Pierre Auger Collaboration’s discovery clearly shows an origin outside our Milky Way galaxy, the specific sources that are producing the particles have not yet been discovered. “We are now considerably closer to solving the mystery of where and how these extraordinary particles are produced, a question of great interest to astrophysicists,” said Karl-Heinz Kampert, professor of physics at the University of Wuppertal in Germany and spokesperson for the Pierre Auger Collaboration.